Hear ye! Hear ye! There’s a royal announcement on the way! Princess? That was so five minutes ago! Your little girl has been getting kind of restless with her minor royal role in the kingdom and lately, she’s been demanding to be queen. 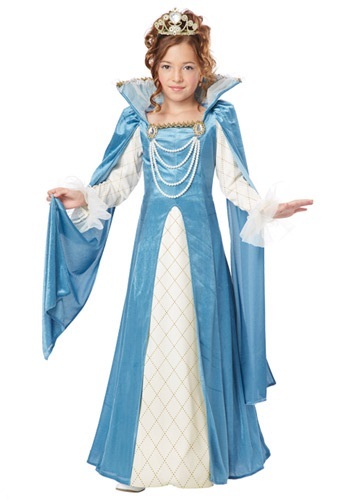 Well, now that it’s Halloween and theme party season, it’s the perfect time time to give her that promotion she deserves: from princess to full-on Renaissance Queen. Of course, now that she’s queen, her wardrobe will have to be upgraded in a big way. And this Girls Renaissance Queen Costume is luxurious and rich enough to befit the most powerful of monarchs. All the fair maidens will be envious of her fortune when she steps out to greet her subjects along the trick or treat route.